AED Authority® is the worldwide leader in Automated External Defibrillator (AED) sales and management programs; providing the opportunity to achieve positive outcomes in very real circumstances. Simplifying saving lives is our business. AED Authority® gives your organization the ability to reduce its risk by being ready to rescue at any time. 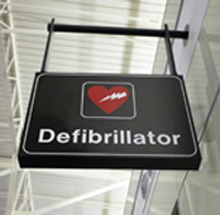 Owning and maintaining an AED(s) in today’s world can be a daunting task. That is why AED Authority® developed AED Concierge® program – covering you and/or your organization in all facets of AED implementation and management. Contact AED Authority® today to develop a Public Access Defibrillation Program (PAD) for you or let us manage an existing one. It’s our business, now you can focus on yours. AED Authority Concierge® is the premier AED management system taking the worry out of your hands. ©AED Authority. All Rights Reserved.